It was quite a nice sight. This chap, with his back to us, is a juggler. He was waiting at this busy intersection with his pins in the afternoon rush hour. Hundreds and hundreds of cyclists were on their way past, but he didn't bother with them. Every time the light turned red he walked out into the zebra crossing and started juggling for the motorists waiting at the light. He probably figured it was rather boring to be sitting in a car so a little entertainment - and a few coins earned - was a nice idea. He didn't make a lot of effort to earn money - he was incredibly relaxed about it. Just content to juggle. 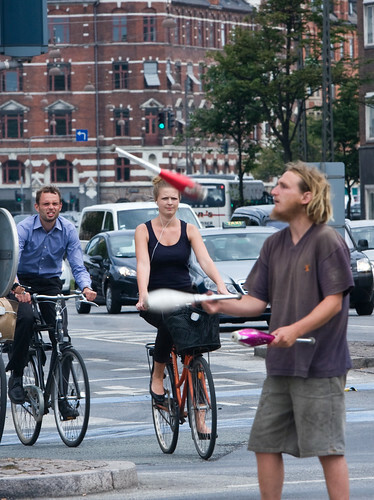 He didn't perform for the cyclists and all the two-wheeled Copenhageners were rather unimpressed with his juggling, if they noticed him at all. Nevertheless, a lovely little slice of streetlife.